The disadvantage of having to cross the Irish Sea to begin the next stage overcame the desire to bag a few more stages of the E2 over the summer. Trips to various parts of Europe took precedence: I don’t have the option of the quick, last-minute-booking weekend away. So, even though the Gritstone Way and Staffordshire Way are perhaps the most accessible parts of the path for me, it was late October before I could arrange to get another stage under way. It was a damp Autumn day when I arrived at the Poachers Inn at Bollington. Luckily, I’d planned to start late in the day and the persistent rain stopped just as I parked on the road below the pub. It always seems to be a frustrating experience starting out on a walk at this time of year: with a great deal of time spent gathering items together, and changing from smart and light clothing (suitable for an air-conditioned car interior) to practical and protective outdoor gear. This Clark Kent transformation complete, it only remained to move the car to the Indian restaurant car park (on advice from a local resident) and start up the GPS (pre-loaded with waypoints for the whole weekend). With some relief, I was finally off up the hill towards the first waypoint. 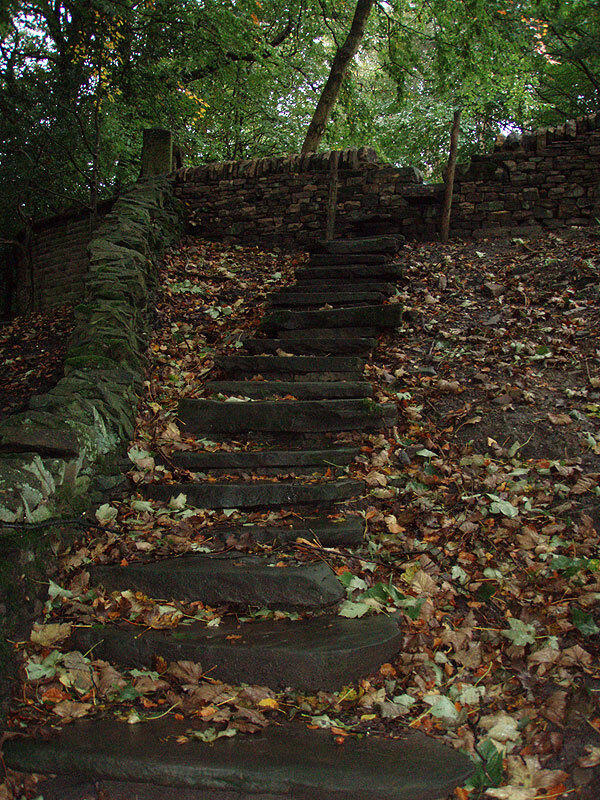 After a short climb along the tarmac road, the Gritstone Trail leads easily along a walled lane, down some steep steps and round the edge of Savio House. 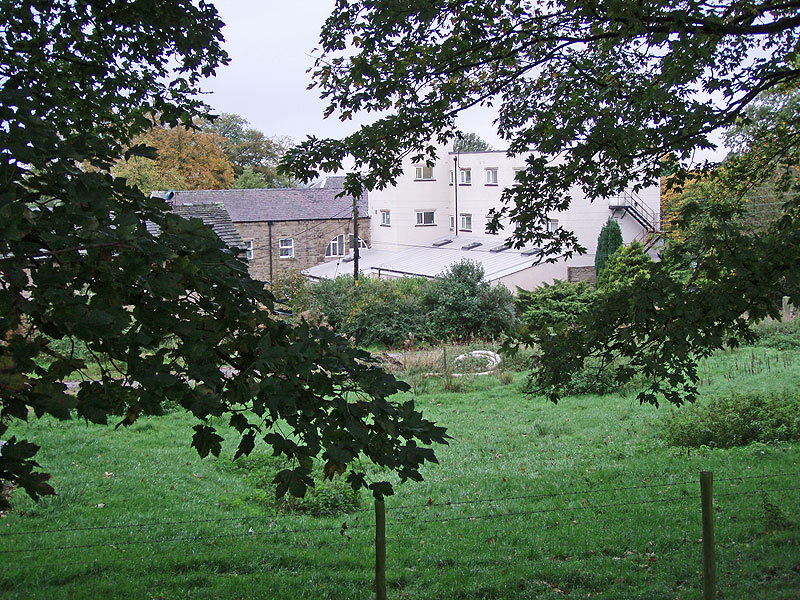 This is a retreat, run by a group called “Salesians”, who bought Ingersley Hall back in the 1950’s to convert it for their purposes. Hopefully not too much indoctrination takes place, but they do seem to take in school groups for religious retreats. The path turns more westerly for half a mile here, down through a damp grassy field and across the young River Dean at a footbridge. 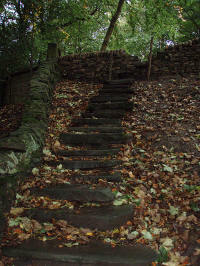 Here begins the steep climb to the ridge of Kerridge Hill, via the recently-built Kerridge Steps. 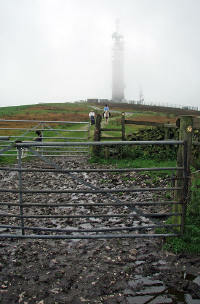 Kerridge is topped at the north end by a peculiar, large white monument called “White Nancy”. 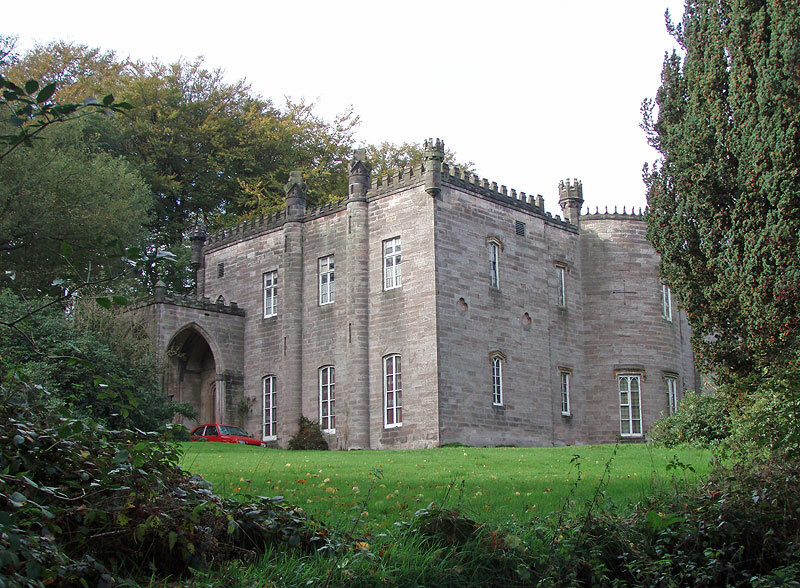 The name is a mystery, but the structure was built by the Gaskell family of Ingersley Hall in about 1815, as a summerhouse. 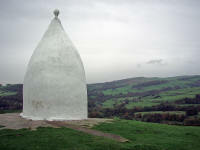 The Bollington town logo features the summerhouse, showing the door (which has been blocked up, sadly). 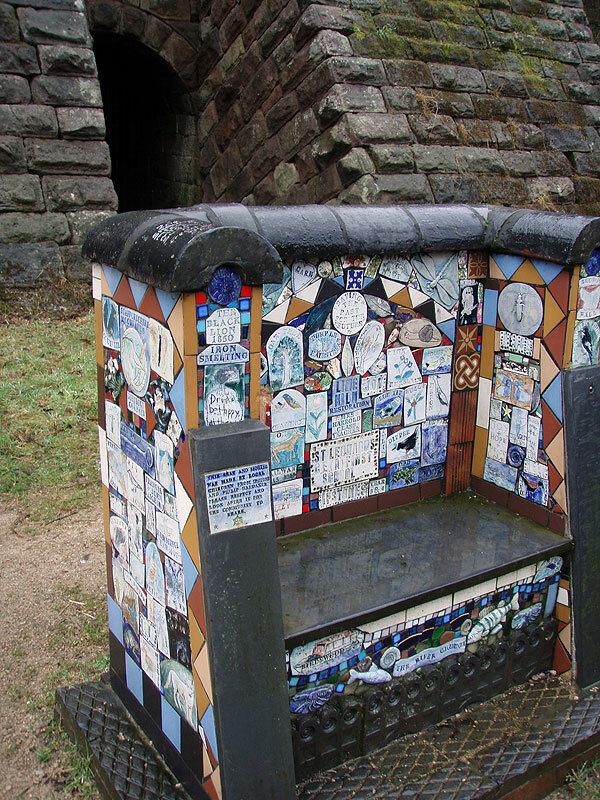 Apparently, in the 1980’s this monument was often repainted for merry Christmas effect. Walking south along the ridge afforded fine views on each side. It wasn’t a great day for this, with heavy grey skies threatening more rain, and the late afternoon light fading gradually from dim to very dull. I lost the Gritstone Way after dropping down from the ridge, failing to notice the left fork until I saw that the next waypoint was starting to get further away, not closer. A quick look at the map reassured me that I could use the path in front to reach the main road at Brookhouse, so I didn’t bother turning back. This was a mistake, as it was quite a bit further this way and took me an extra half hour. The walk along the road to the edge of Rainow was not particularly interesting as there is a lot of noisy and smelly traffic rumbling by, so I was pleased to be back on the path, even though there is quite a climb up to the Hordern Farm track. A right-angle turn here to the southwest led to the edge of a steep gorge: the path disappeared at the edge and it was difficult to spot the stream crossing at the bottom. A very steep pull up the other side, past bemused cattle, led to the A537 and fast traffic (this is the main road between Buxton and Macclesfield). Taking my chance to sprint across the road back to the safety of the Gritstone Way, I then slogged up a dull grassy section to the quieter road which bypasses Tegg’s Nose. There is a large car park here (looks expensive), and a good track leading to the quarry: which is now a popular country park. 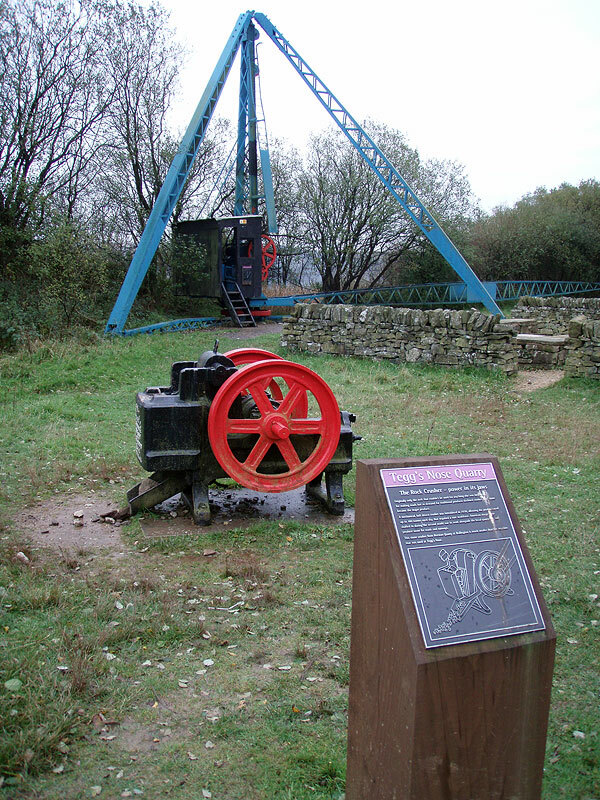 Here there is an exhibition of rock-crushers and other industrial machinery from the days of quarry working; but on a bright day the best part would be the view from the southeast edge. The view was still pretty good even on such a dull afternoon, but I couldn’t stop for long as I had a bus to catch from Langley and not much time to find the stop. 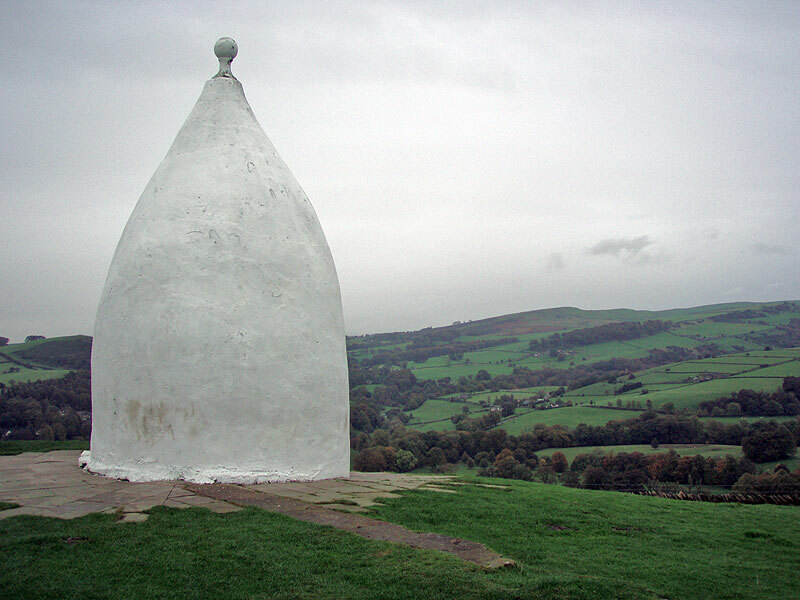 I just had time for the Tegg’s Nose geocache (luckily it took seconds to find). Then there was a steep and surprisingly long descent to the reservoirs above the lovely village of Langley. Here began the public transport section. Always tedious and stressful! After finding the bus stop easily, the bus arrived (ten minutes late, but not too bad). 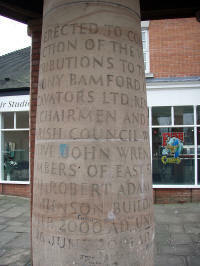 This took me to Macclesfield Bus Station, where I had to change to the Bollington bus. This had been rescheduled to leave 15 minutes later, so I had nearly an hour to wait. The bus did get me within two hundred yards of my car, but it took as long by bus as it did to walk! 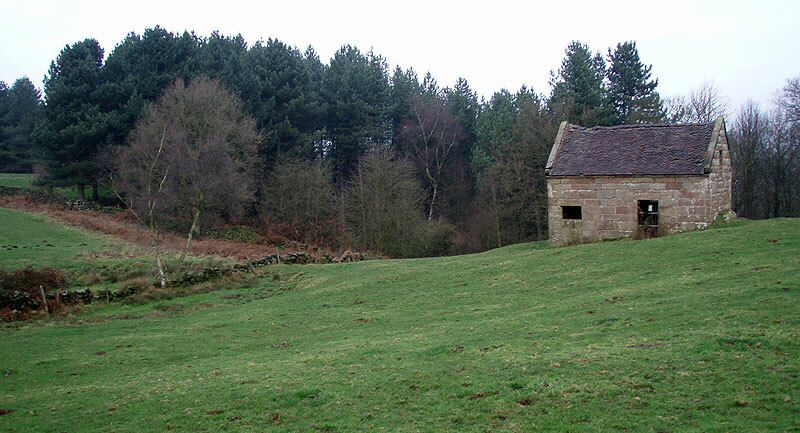 From here, I drove to Rushton Spencer, a few miles northeast of Leek. I’d booked two nights in the Rushton Inn: after this warm-up section I would have a more serious walk the next morning, then a short warm-down day on the Sunday. The Rushton Inn (http://www.rushtoninn.co.uk/) was a good choice: reasonable rates (£38 including breakfast and dinner), large and comfortable rooms and a huge luxury bathroom. The proprietors were very friendly and welcoming: they built up the business after retiring from the fish and chip trade, so it's worth ordering a fish supper if you ever stay there! There wasn't much else to do in Rushton Spencer so I just stayed in, ate and had had an early night after a long and tiring day. Breakfast was as early as I could arrange (8 o'clock). I knew that time would be tight today, as my parents were going to meet me at the Rushton Inn at lunchtime and I had to drive to Langley for the restart then walk eleven miles back to Rushton Spencer. Back on the E2 before nine, after parking in the southern Tegg's Nose car park, I was looking forward to a solid morning's walk - not too far and not too much of a rush. No rain, but a grey and murky morning greeted me as I headed past the reservoirs of Langley and past the waterworks. 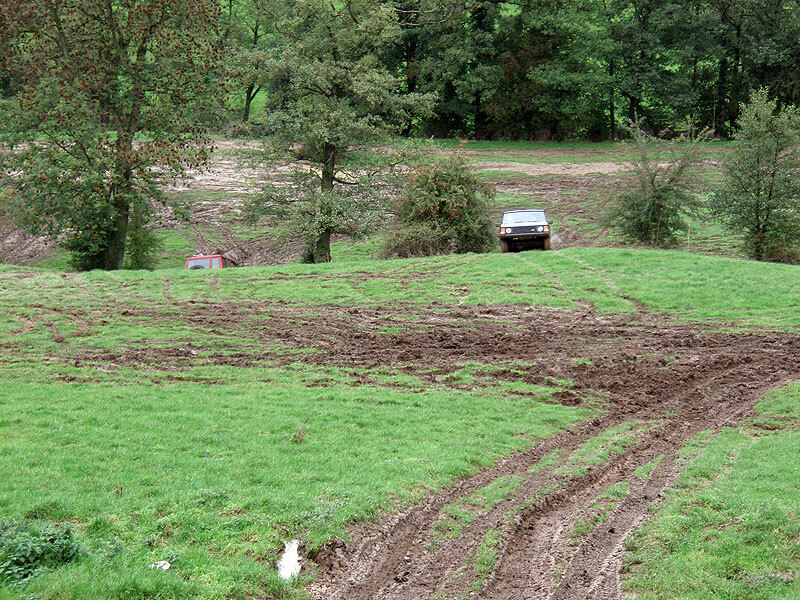 At Greenbarn, the GPS sent me unexpectedly up a steep and wet field. 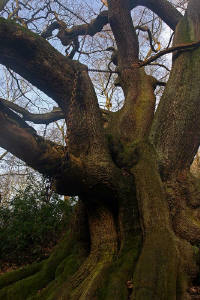 Checking my position, I realised that I'd planned to take in a geocache just off the trail. 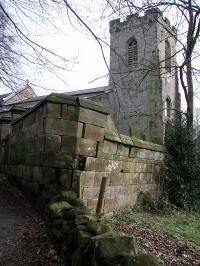 Unfortunately, this turned out to be over the other side of a wall and out of reach, so the climb was in vain. 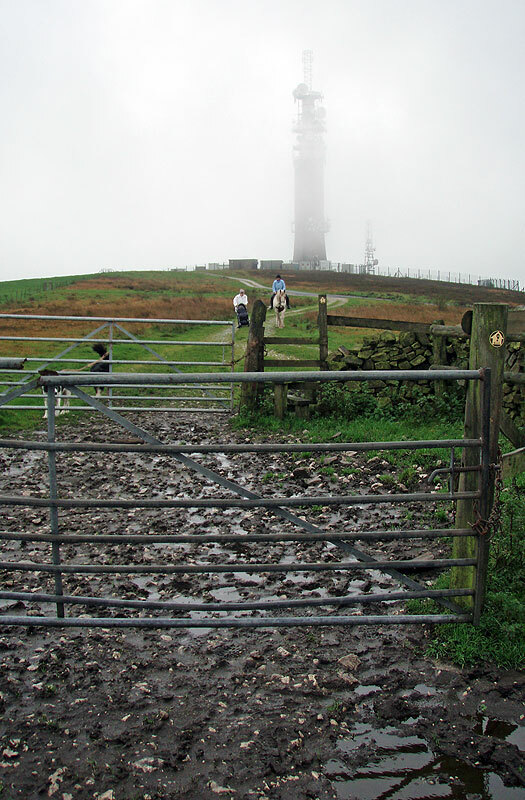 Undaunted, I returned to the trail which led awkwardly through muddy fields and round the back of (very nice) houses until beginning the gradual rise into the hills overlooking Macclesfield. 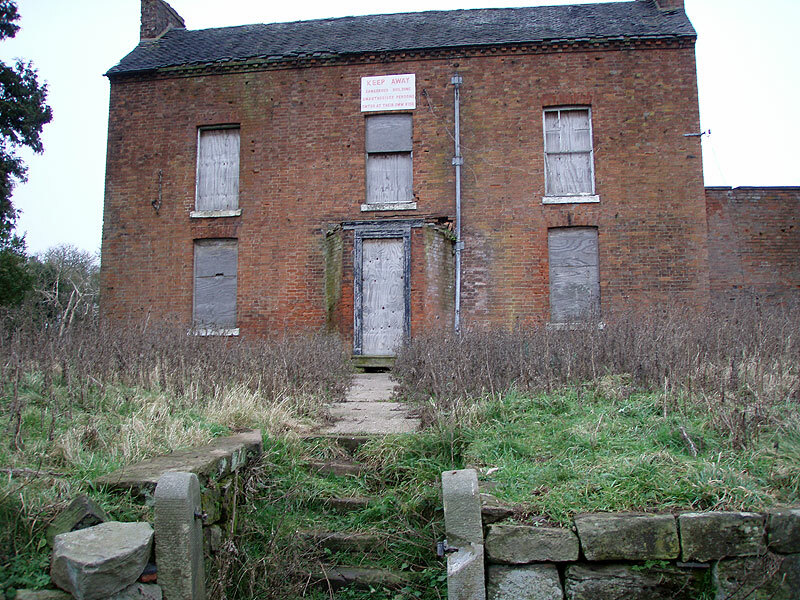 A slight descent to the hamlet of Lowerhouse led past a pub (according to the map) which appears to have been converted into a house. Crossing the road here, I discovered that I'd undertaken a short diversion but was soon back on the trail as it led over a stile and up a steep ridge westwards to the main ridge of Croker Hill. 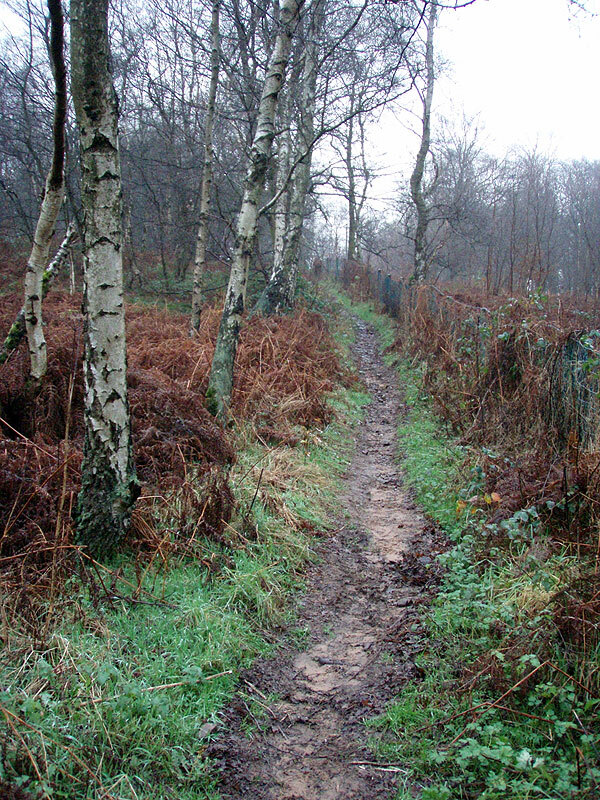 I didn't mind the effort as the mud was getting less widespread with the increase in altitude and the gradient eased as the path turned south along the ridge to Croker Hill and Sutton Common. There were fine views from the airy crest, and ground more like the uplands I'm used to. As I approached the massive communications tower that dominates the summit the weather turned very chilly, with a cold wind and low cloud that masked the tower except for occasional glimpses. Here I found a couple of women out for a stroll: one on horseback and one pushing a pram, a dog in attendance. They turned back at the muddy footpath, but it still wasn't very pleasant for a stroll - I can't imagine what the baby thought to it. I reached the top just after half past ten, and was soon descending to the A54 which uses the col between the ridges of Sutton Common and Bosley/Wincle Minn.
A short and unpleasant trot along the main road led back onto the hillside. 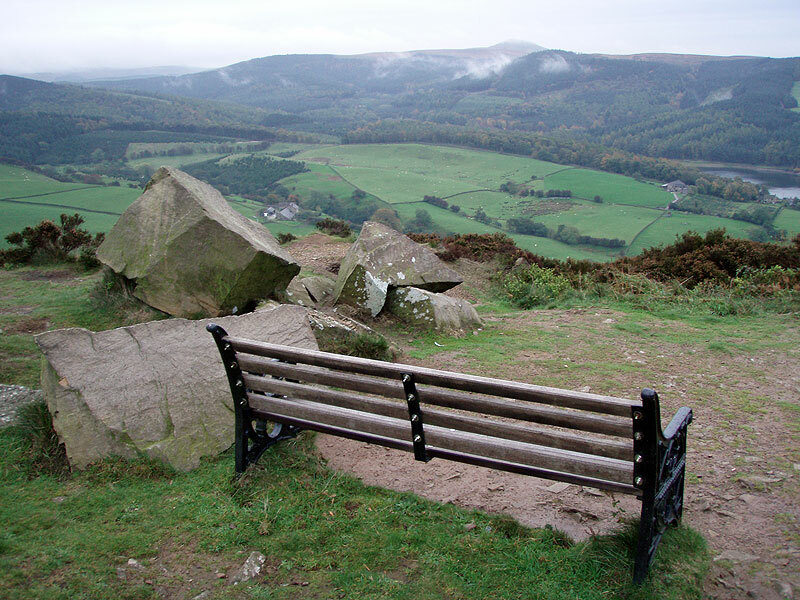 The Gritstone Trail keeps to the ridge again here, heading generally SSW with easy walking along a quiet and open tarmacced road - unfenced so giving fine views. A mile at a very good pace helped gain a bit of time; it's always worth getting a bit ahead of schedule when walking to a fixed itinerary. The descent to the Shell Brook was most enjoyable, with more of a wild feel to the land. 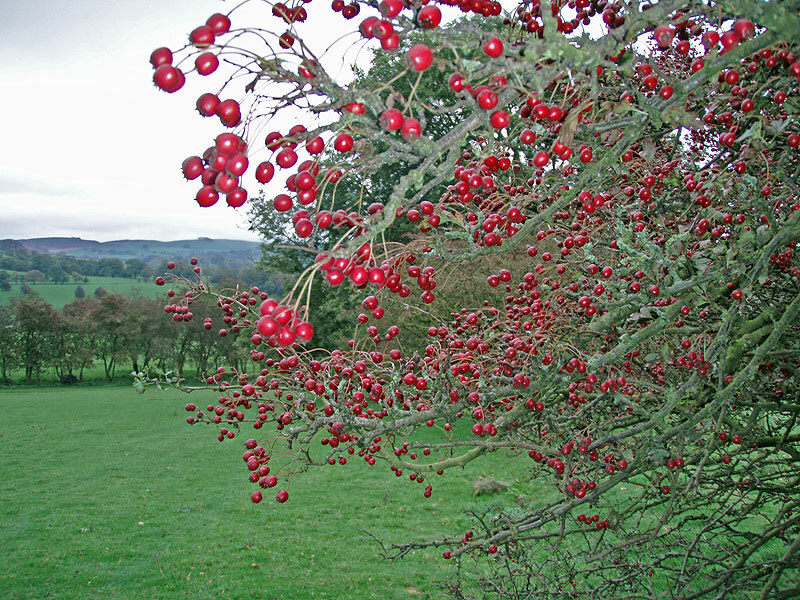 Berries and fruit on the trees lent colour to the surroundings, and the geocache at the Dumkins (there used to be 15th Century farmouse here, now sadly dismantled) added interest and gave an excuse for a short break. It was right at the side of the trail too, which was a bonus. Following the trail to the River Dane from here was a rather slippery and muddy experience, although through pleasant fields. Crossing the river, a short climb and sharp turn led onto a canal towpath. 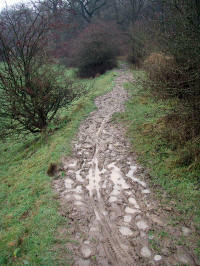 These normally mean steady and easy walking, and the path was agreeably wide. 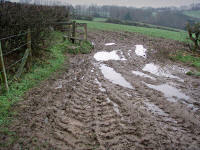 The first walkers I'd seen all day warned me of mud ahead, but I didn't expect it to be any worse than earlier on the trail. It was though! I think that the canal used to feed Rudyard Reservoir from the Dane, but is now disused. 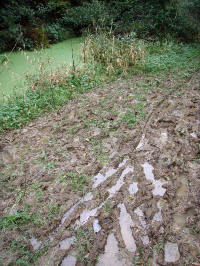 With all the mud, the going was heavy and slow and I was looking forward to leaving it. 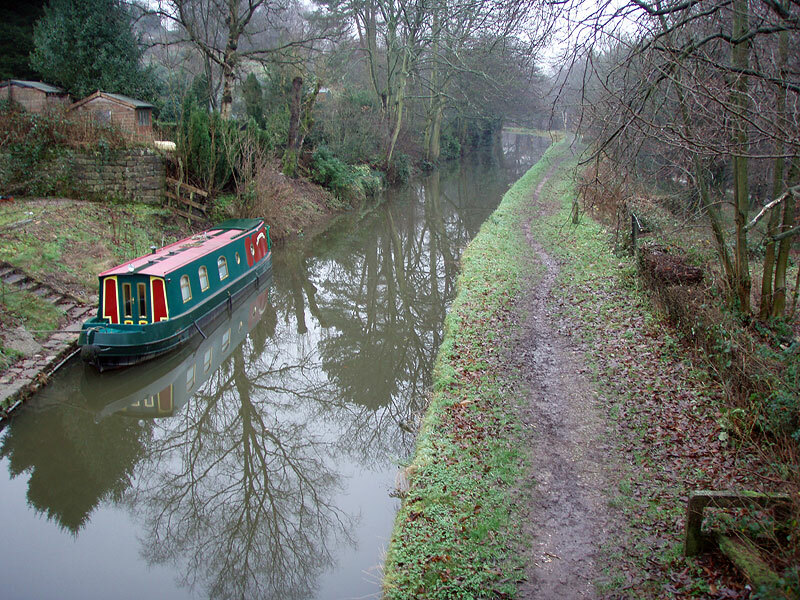 At one point there was the smell of diesel and the noise of engines from puzzlingly close to the canal. 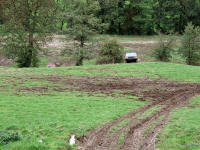 I soon came across a large field with 4-wheel drive cars ploughing unsteadily through the mud. It was surprising how much they struggled, barely able to move along the flat and never making it up the short banks of the training course. Perhaps conditions were too extreme, or perhaps the drivers weren't very good. 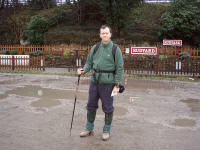 Leaving the towpath with relief, I crossed a wet field to the main road then across to the railway bridge. Turning here to join the disused trackbed, the trail took me parallel to the A523, past the Rushton Inn to Rushton Spencer centre. A quick march back along the main road returned me to the inn, just as my parents arrived at one o'clock. 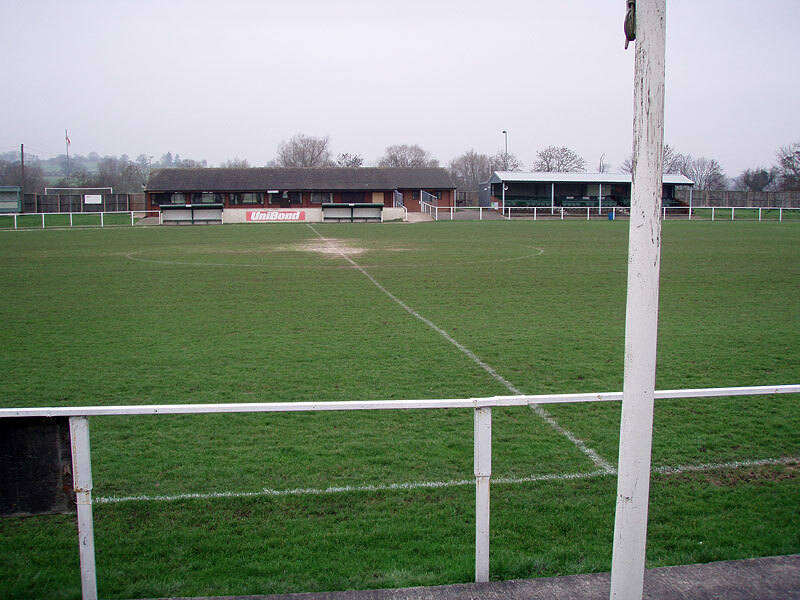 We had lunch at the inn, then proceeded to Macclesfield for a football match (Mansfield won 3-2), from where they took me back to the car at Langley - very useful! Back to the Inn for the evening, and a good hearty meal followed by an early night. A fine day at last! Itching to get out and enjoy the sunshine, breakfast passed quickly. 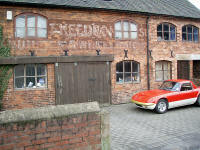 Then, bill paid, I was in the car and on to the short drive to the starting point. 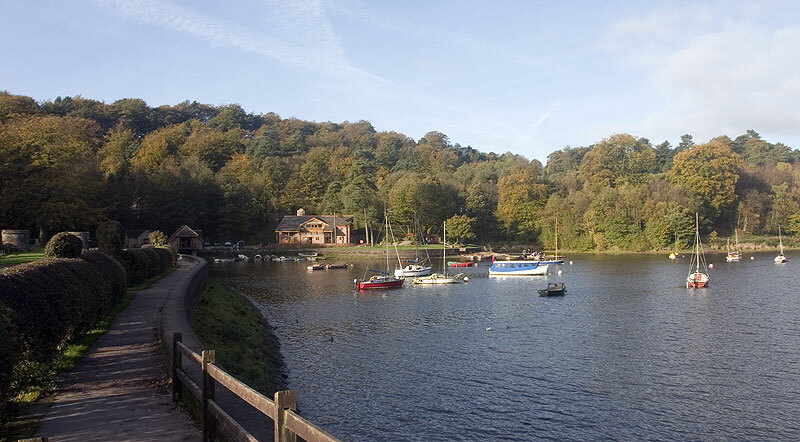 I arrived at the Rudyard Lake Steam Railway station car park, just south of the lake, at 9. 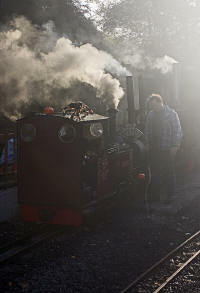 The sunshine gleaming on the wet clay surface contrasted with the dense smoke from an engine just getting up steam. 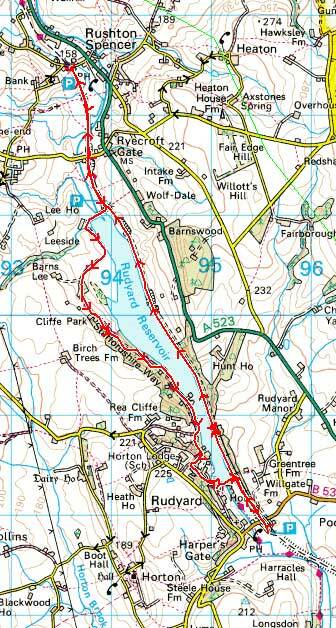 The plan was to walk back along the eastern side of the lake, returning to yesterday's trail finishing point at Rushton Spencer. 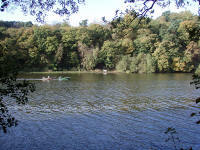 Then, I would walk back along the Staffordshire Way, which follows the western bank of the lake. I was soon into my stride. 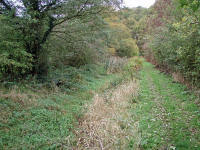 The track is flat and easy: at first, it runs along the side of the railway and then the old track bed to Rushton Spencer. Here I retraced my steps back along the E2. At the turn, I decided to take a photo of the old station as this is one of the few buildings in this hamlet and is characteristic of the railway walk. The station is now a private house, and a resident appeared: he was obviously preparing to clean his car. Although I was careful to stand on the main road in the village centre, thus legally allowed to take photos without needing special permission, the resident challenged me; "Taking photos, Sir?". I asked him whether that was a problem, pointing out that he didn't appear in the photo (the photographer has to ensure that there is no invasion of privacy). "Be nice to be asked, Sir, don't you think?" he replied. I apologised, and offered to delete the photo and then ask permission. "Bit rude, Sir, if you don't get permission. Specially if it's for commercial use, Sir". 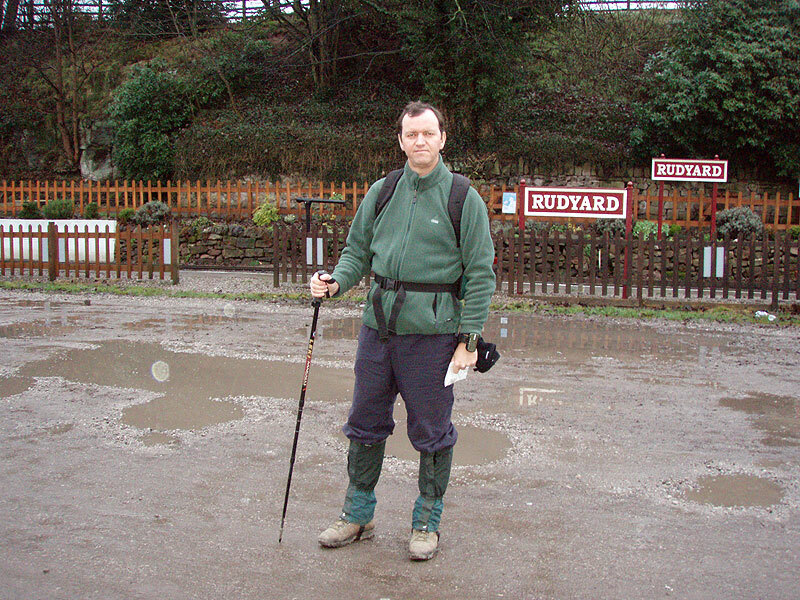 I mentioned that I was not expecting to use the photo commercially, and observing my hiking gear and trekking pole I think it dawned on the gent that "Sir" was merely a walker taking a snapshot for a memento! Back to the walking. I'd expected a cold wind, but the temperature was getting higher by the minute. By the time I turned west around the north edge of the lake it was very much short-sleeves weather, which suited me fine after two grey, chilly and miserable days. The path follows the lake for a short distance before striking off towards Cliffe Park, the former golf clubhouse and (later) Youth Hostel. 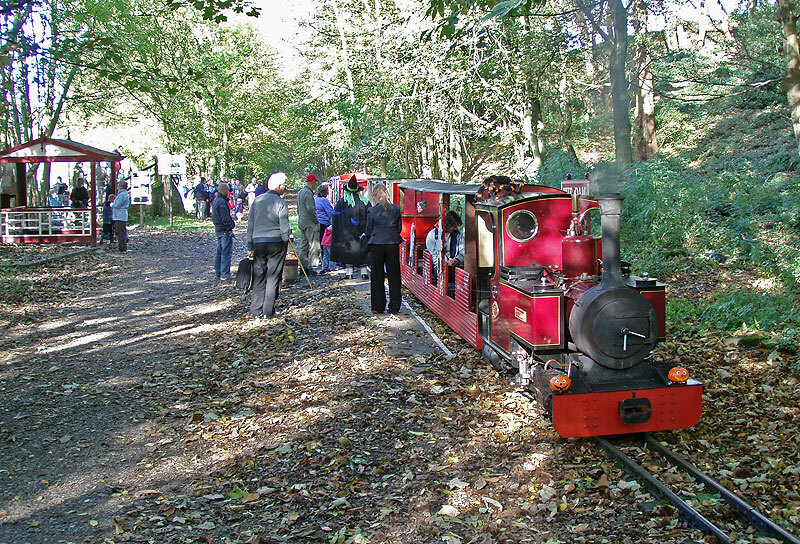 Passing the hall, which must be an excellent redevelopment prospect, a leafy track led into beautiful lakeside woodland. 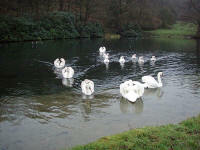 By 11.15 I was making my way along the track, between lovely little weekend cottages overlooking this magnificent lake. Not a very productive day as far as adding to the E2 mileage, however, with only three and a half miles achieved. 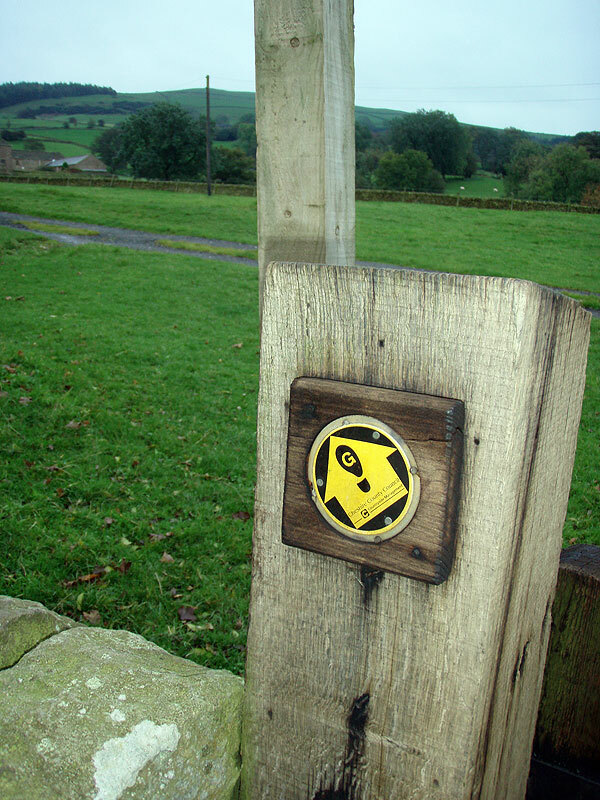 But it places me in an accessible area: I plan to take advantage of this as soon as possible, and have the Staffordshire Way complete before Spring 2007! Back in the UK unexpectedly, visiting my ailing Grandmother, it turned out to be feasible to stay overnight in the Peak District and take an extra day on the way back to the Isle of Man. The route to Manchester Airport took us close to Leek - or at least, the diversion was only a minor one, so Chrissy dropped me off at Rudyard station and spent the day in Leek while I walked down the Staffordshire Way to Oakamoor. We stayed at the Lathkil Hotel: a peaceful haven on a quiet Sunday evening, and one of our favourites. 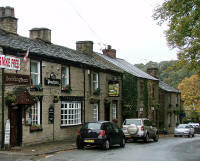 So, after an excellent breakfast we drove the short distance to Rudyard - by which time the rain had stopped. Under way just before 10 a.m., I found the first Staffordshire Way sign and set off southwards. 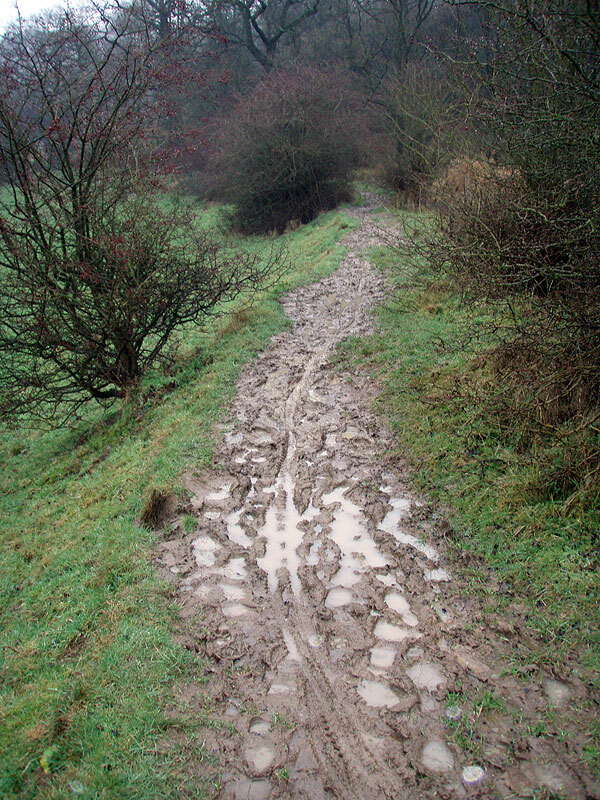 At first, the going was easy along a good path, but the ground soon became very muddy: the sticky, clayey sort of mud that makes progress an effort. 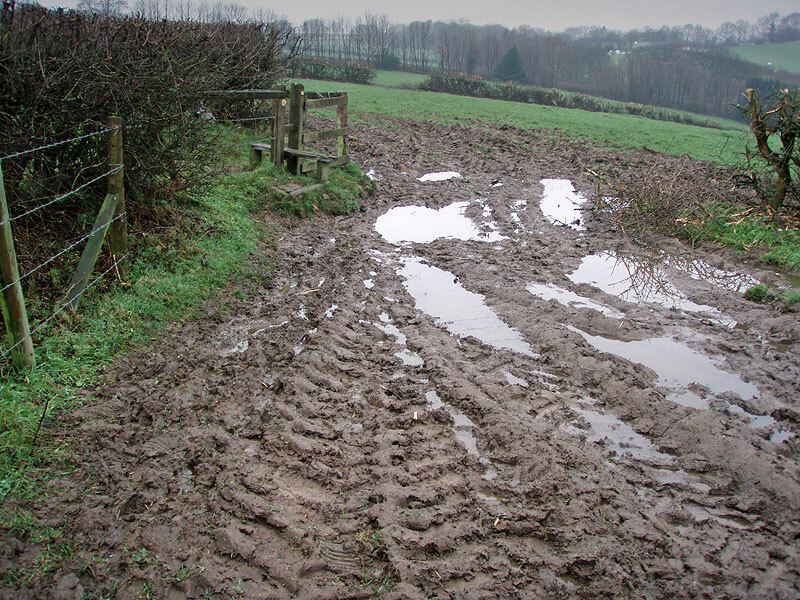 Partly the problem is that you have to watch your footing to avoid the worst of the mud, partly that every step takes more effort with the lack of grip. 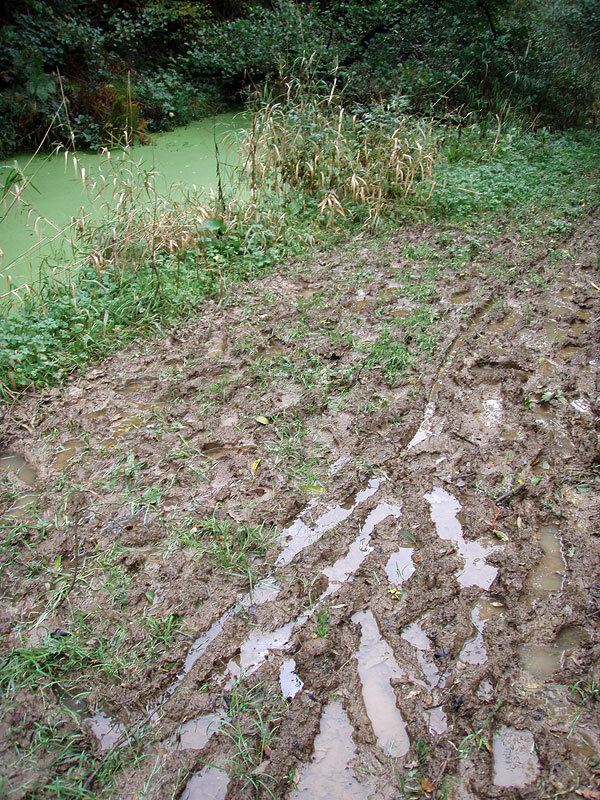 Surprisingly, the mud was as bad as anywhere on the path which followed the top of the embankment: I did try walking in the field at the side but this was very muddy too, and uneven with cattle footprints so the path was better. 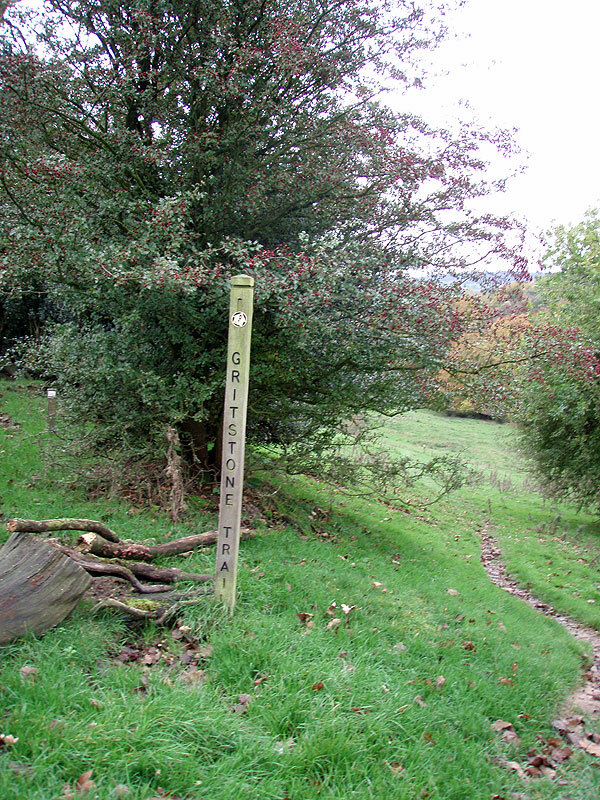 At least the way was level, and with pleasant views across a golf course to the meandering Churnet. 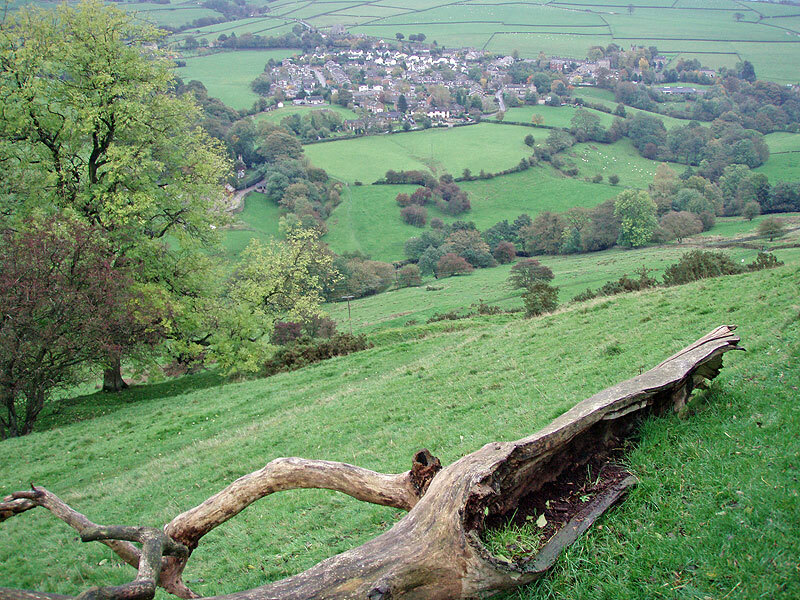 From the valley, the path turns sharply and then steeply uphill to the village of Longsdon. A lane between houses led down to a sandier and firmer path through woodland and into a small valley full of transport links (two canals, a road and a railway). 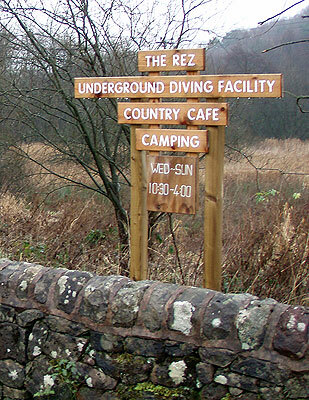 Between the two canals is the entrance to "The Rez" (Link), a Victorian reservoir now used as a "total darkness" cave-diving venue. 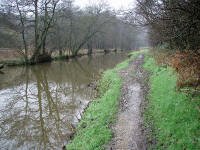 Leaving the road, the Way turns onto the Caldon Canal towpath for six miles. 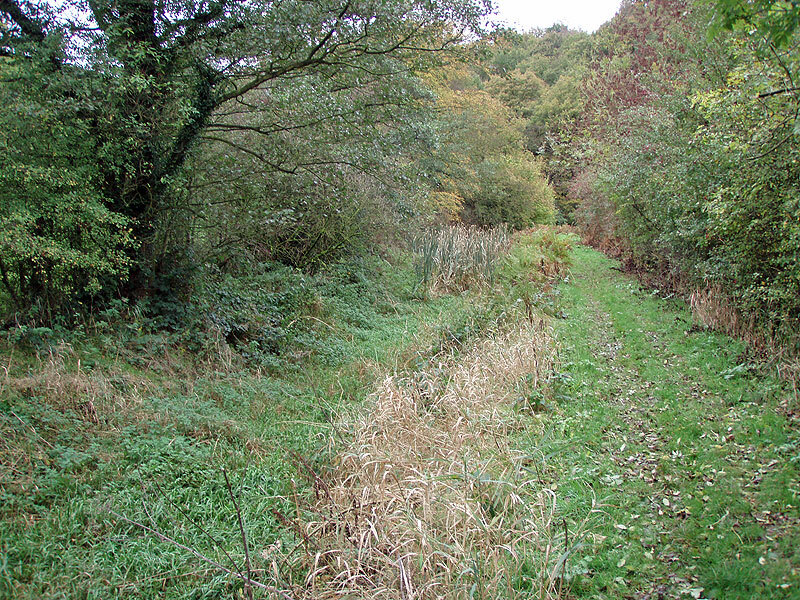 This is a walker's" motorway" along a branch of the Trent and Mersey Canal, flat and with a good surface: a great relief after the muddy ground earlier. 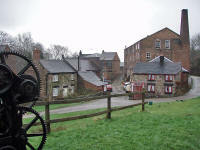 Fifteen minutes walk along the towpath, I passed the Cheddleton Flint Mill: quite a historic spot. 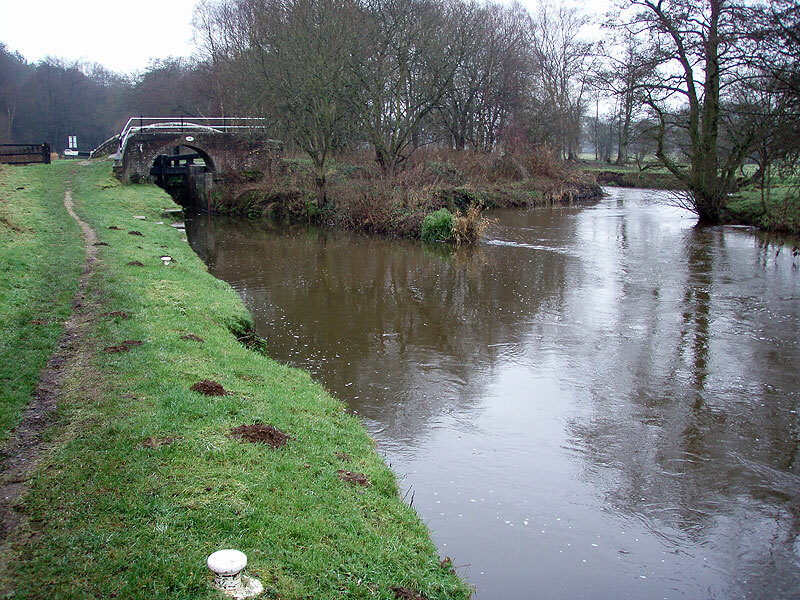 The flint was used in the production of white earthenware and was shipped along the canal system from the south-east of England. 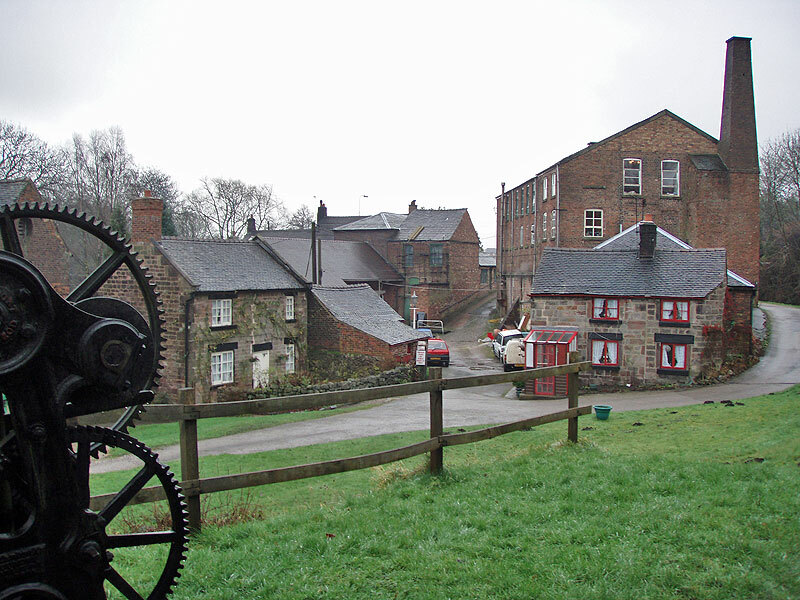 The mill was driven by a waterwheel throughout its working life (1783 to 1960), and the daughter of the last miller still lives in the cottages. 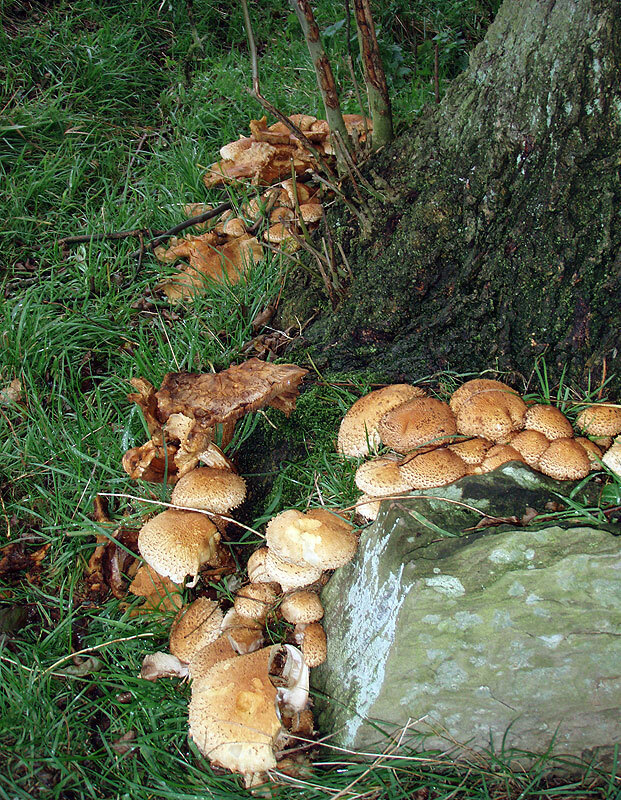 The weather was staying dry, although with a little drizzle, but the grey skies limited the photographic opportunities: so apologies for only providing rather dull snapshots! 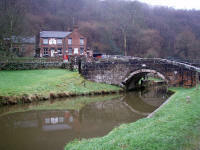 Two miles further down the towpath, at Oakmeadowford Bridge, the canal joins the River Churnet. Boats have to navigate the perilous rapids of the river for a mile and a half, until reaching the safety of the continuation canal at Consall. A large sign warns navigators hoping to leave the canal to check the marker below the lock: if the water is too high for safe progress, only the red part of the marker is visible (as in the photo). 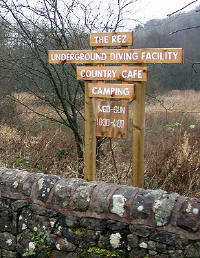 Pleasant and easy walking along the river, with views of the Steam Railway, took me to Consallforge. 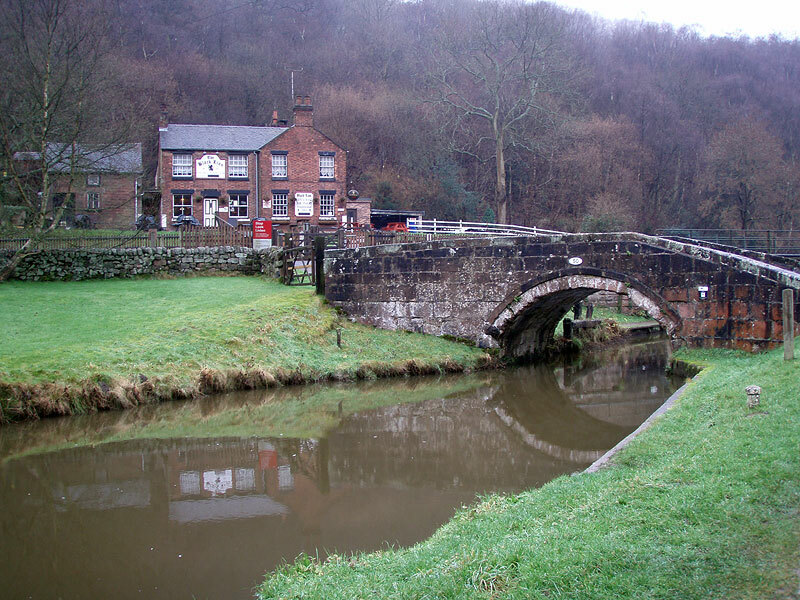 Here there are lime kilns (1810), a pub, a railway station (the Churnet Valley Railway was opened in 1849 and still runs steam engines) and bridges: an important place even though there are virtually no inhabitants. 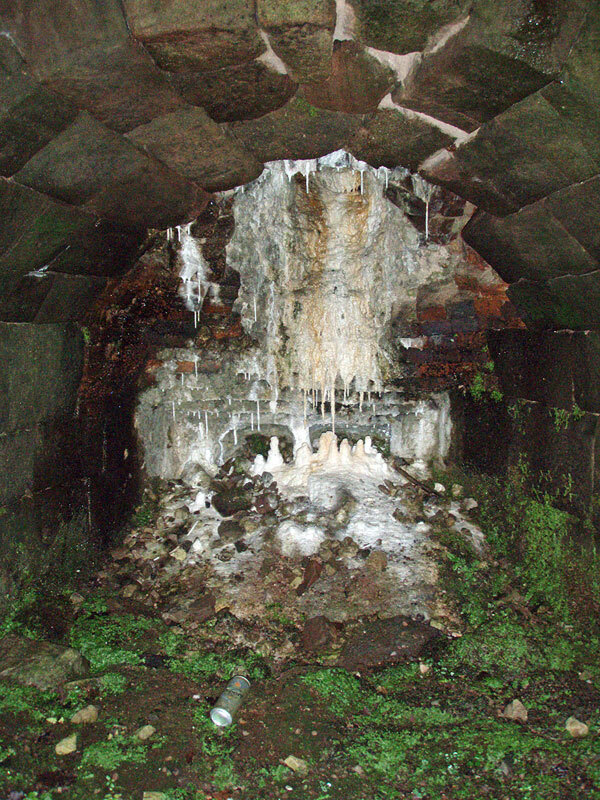 I stopped for a few minutes here to inspect the kilns and log the geocache. 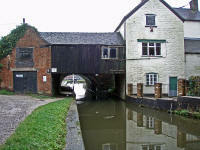 Although it was a quarter to one, I didn't visit the inviting-looking pub, but strode on south-east along the canal. Before leaving the canal, I had the privilege to see a kingfisher demonstrating its spectacular flying ability by hurtling through the trees at the side of the canal. 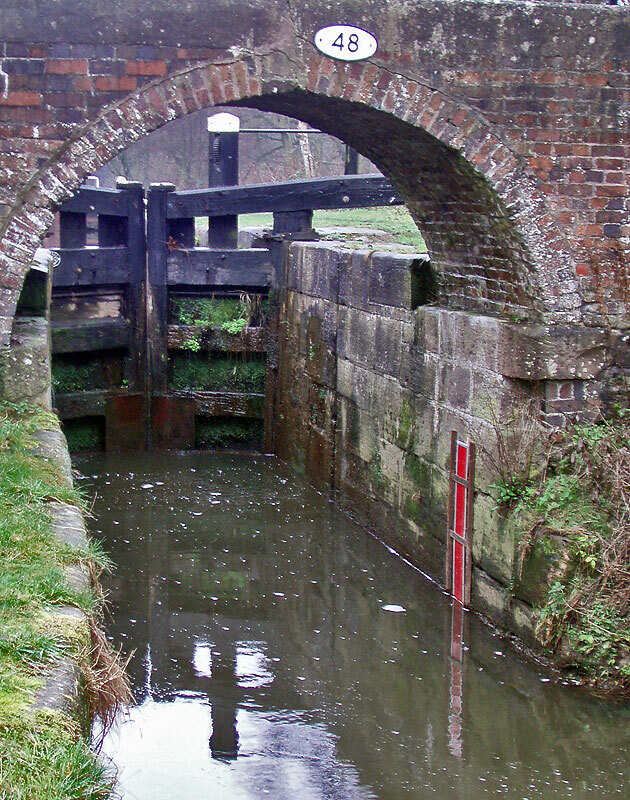 A mile and a half from Consallforge, the Way takes leave of the towpath and adventurously strikes off into the hills to the south-west. It was twenty past one, and with ten miles completed I called Chrissy to update her on my ETA: a bad choice as much slower ground was ahead! A very steep climb to a road took me past a couple of walkers (tentatively tackling the slope with the aid of trekking poles). Above, another steep climb alongside a bird sanctuary took me to open fields. Here, even with the GPS, it was awkward to keep on the correct side of barbed wire as the path had disappeared, and I ended up in a very muddy area on the edge of a farm, teetering along the edge of a fence until I was able to climb a gate into the correct field. 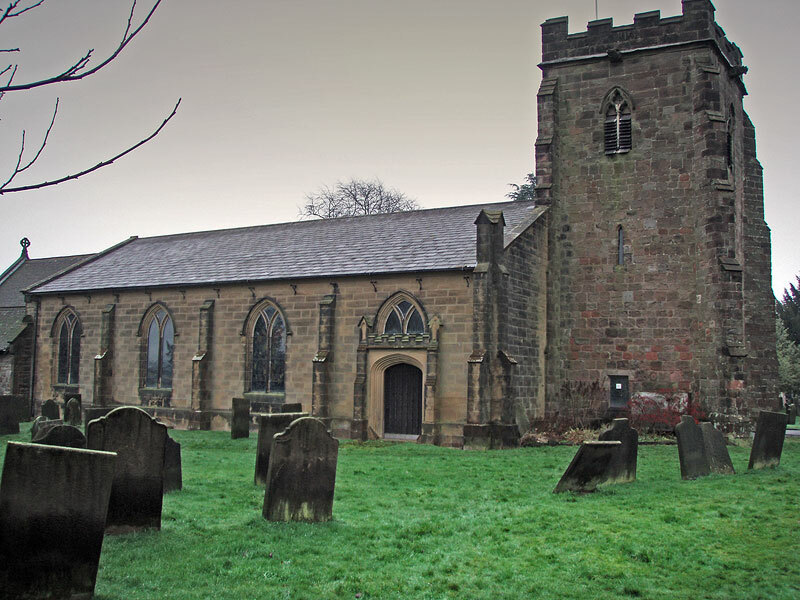 After passing through Kingsley via the churchyard (the church mostly dates from 1821), more open fields led very muddily to Kingsley Holt. 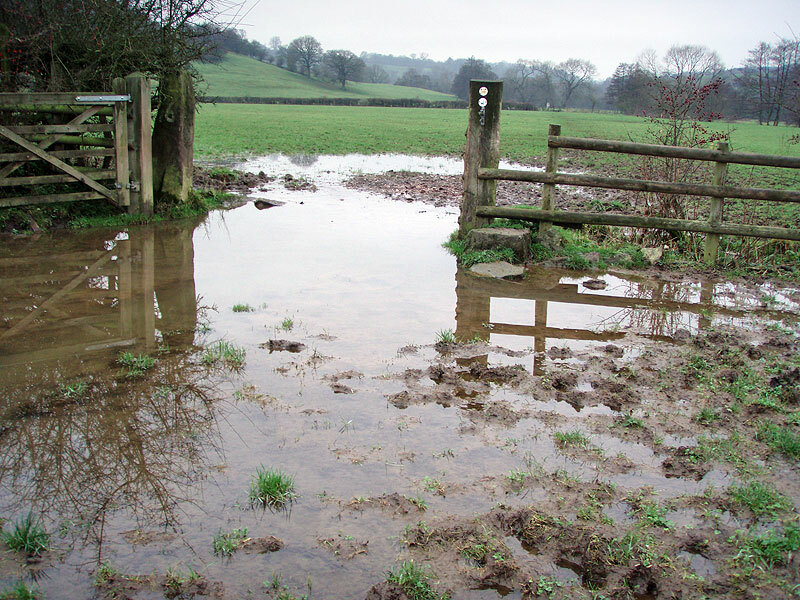 There was no sign of a footpath, except for the stiles at field boundaries, and the ground had been badly cut up by cattle and tractors so it was slow going. A downhill section to the river after Kingsley Holt would probably be very pleasant in summer, but the wet and uneven ground made it an effort. Chrissy phoned to ask for instructions on using Sat-Nav so that she could get to the rendezvous point, and I lost the route temporarily whilst talking and trying to balance in the slithery mud. 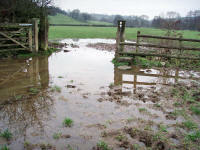 At East Wall Farm the mud peaked out: I had to pick a way through ground that was beginning to flood. 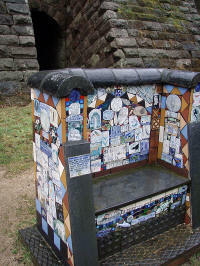 The water table was some way above ground level. 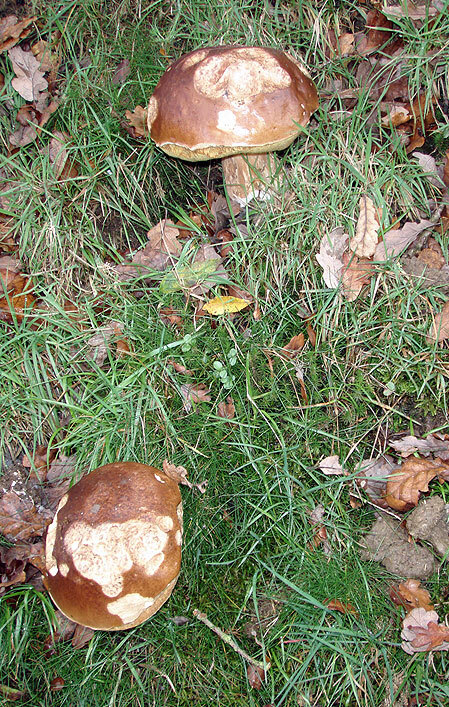 It was a relief to climb out of the valley, past the farm pond and into Hawksmoor Wood, where the soil is much more sandy and better-drained. 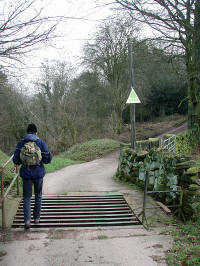 A pull up the hill from the farm led to the main road to Oakamoor. I crossed this and continued via a sandy runnel down to a minor road near Oldfurnace and the waiting Chrissy: arriving on time at 3 p.m. with plenty in hand for the drive to Manchester Airport and home. I expected to return in the new year to finish off the Staffordshire Way, but it turned out to be rather earlier than anticipated. 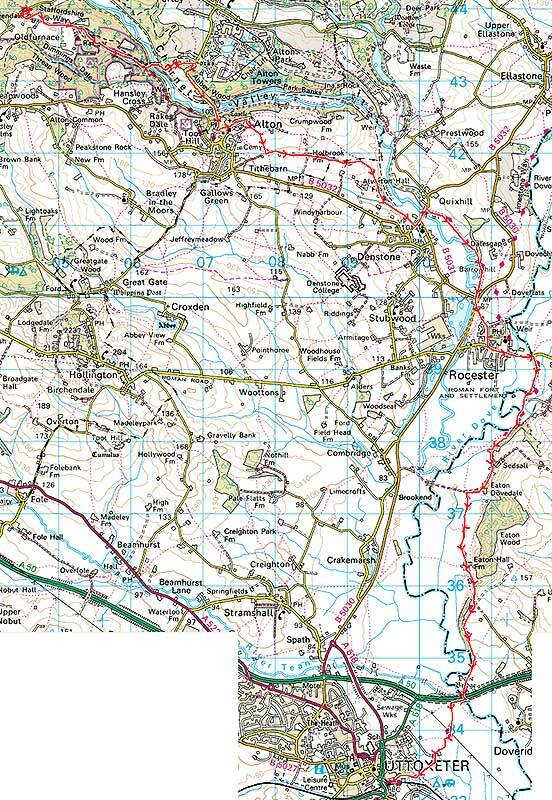 The original plan was to stay at Oldfurnace for a couple of nights (there is an excellent-sounding B&B there which specialises in catering for those walking the Staffordshire Way). Unfortunately, we had to pay another visit to the UK between Christmas and New Year - "unfortunately" because it was to attend my Grandma's funeral. This was to be on the 28th December, so we'd have to travel from the Island on the 27th. To break the journey, we decided to stop at the Staffordshire Way, where myself and my son Graham would walk to Uttoxeter. Graham's fiancée would join Chrissy for a day's shopping in Ashbourne while Graham and I walked: we'd meet up at Uttoxeter Railway Station. Graham isn't particularly keen on countryside walks, but I think he regarded this as the better option, not being a fan of following ladies around shops either. He is reasonably fit, so I didn't expect him to have any trouble with a walk of walk of twelve miles over undulating farmland. The first section was the best of the day. 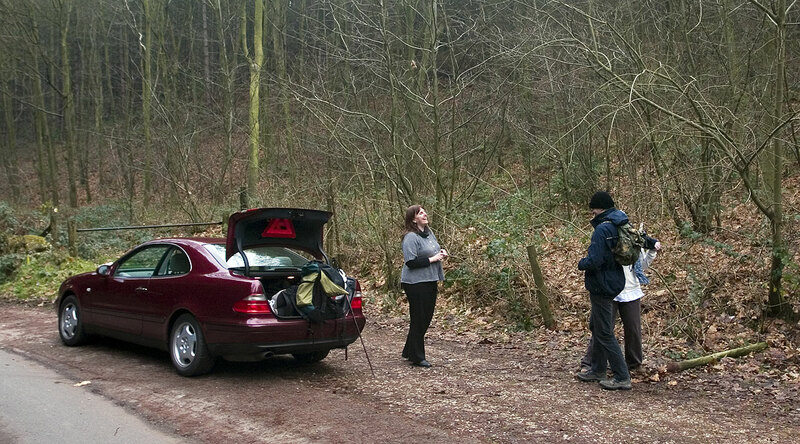 A slightly confusing route through woodland took us to open pastures reminiscent of the Black Forest in Germany. Leaving a tarmac lane at the Youth Hostel, the path led down through a beautiful small valley (the lower part of Dimmingsdale) to Dimmingsdale Lodge, now known as the Rambler's Retreat, a lovely cafe/restaurant. The Way follows the road here for a section before threading through Alton, but we ventured on a diversion to see the "Chained Tree" on the edge of the Alton Towers estate. This is supposed to have been chained by the Earl of Shrewsbury in 1821, to ward off the effects of a curse. There is a geocache here too, so I swiftly located and logged this and we continued up the hill to the road bordering the theme park. 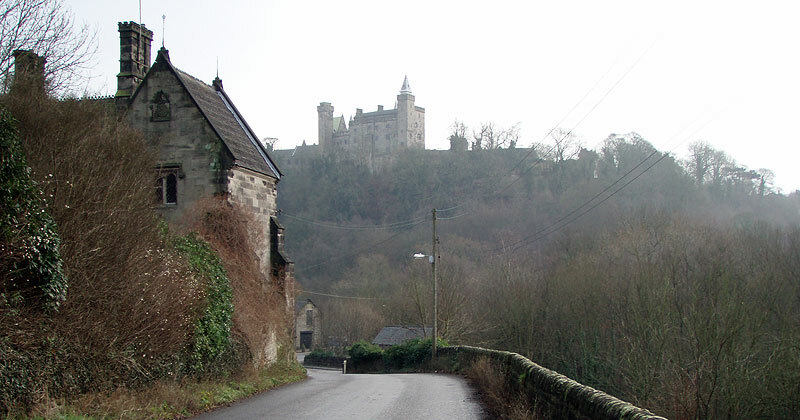 This approach gives a good view of the superb Alton Castle: now a Catholic Youth Retreat Centre. The Way turns off at the top of the steep hill, just short of Alton centre, and takes a back lane past St. Peter's Church and the entrance to the Castle. 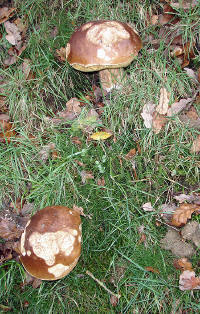 Quickly, we were in open countryside and following a good path through damp fields and by the side of farms. 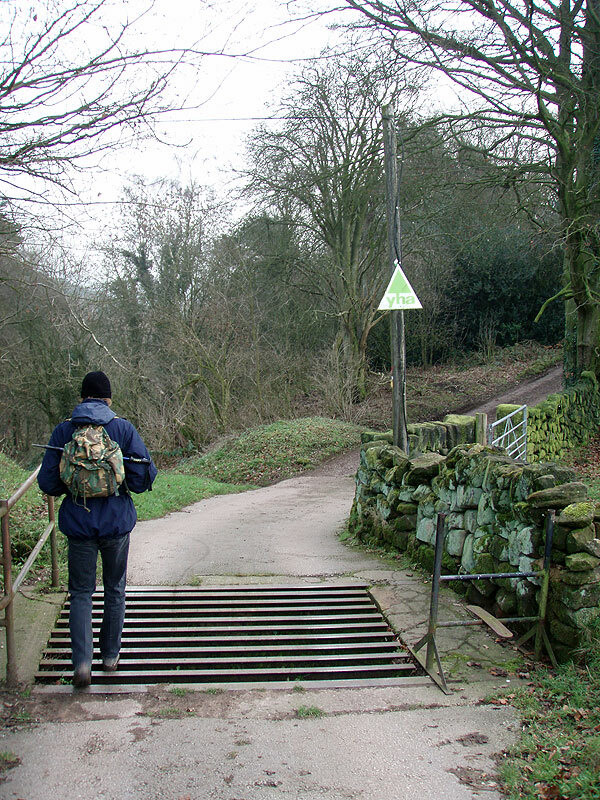 Using a road bridge to cross the Churnet for the last time, more open fields ensued, until the path was forced against river terraces and up through a small wood to reach the B5030. 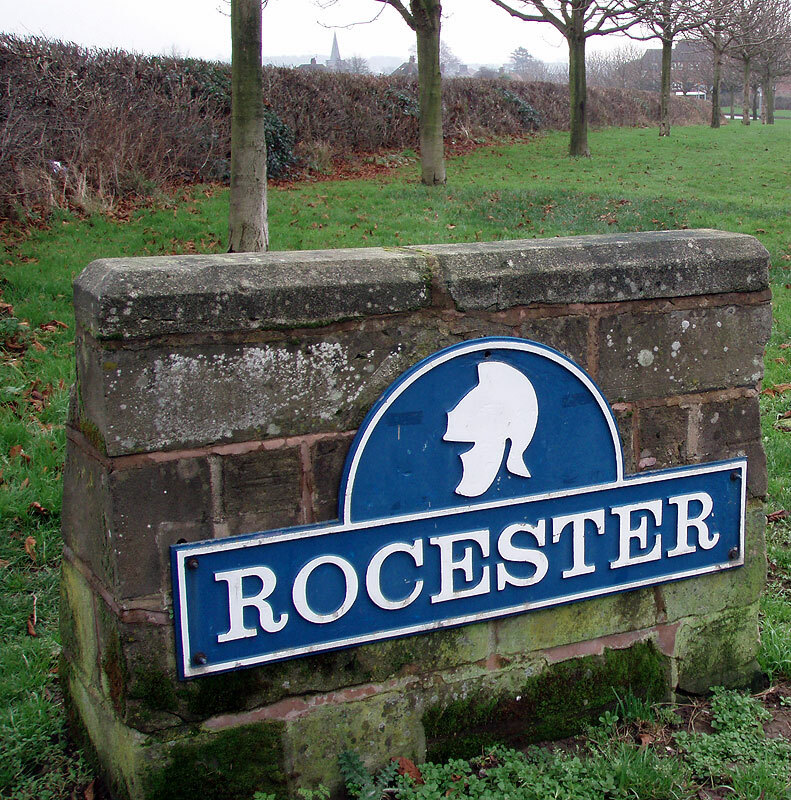 Here, we crossed via a new roundabout with views of the JCB works across (what appear to be) an artificial lake, and entered the village of Rocester. 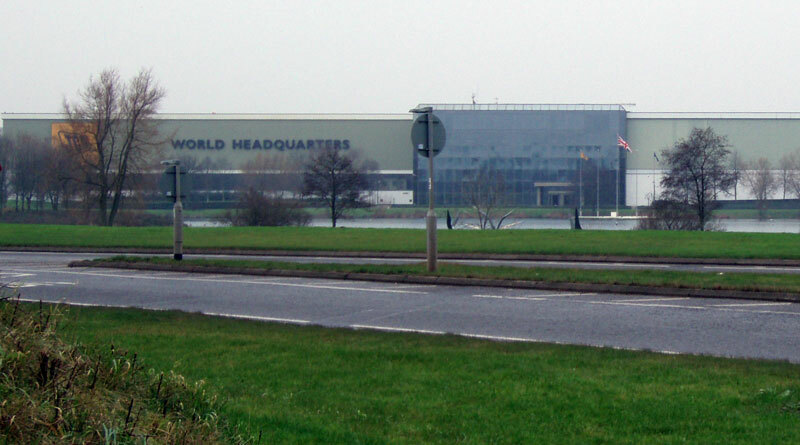 The works are impressive: JCB is still run by the local Bamford family, and since 1945 has evolved into a massive worldwide business. 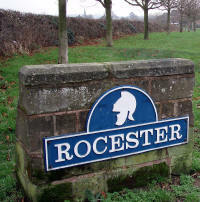 The Rocester JCB lakes actually cover 42 acres, but the village grew up around the milling industry (the grinding of potters' materials). The E2 takes a direct line into the centre of the village, where we stopped to examine the Bamford memorial. The housing is quickly left behind as you head west out of the village, where the Limestone Way begins its route north. After passing the football ground, it was back on to softer surfaces again as the walk continued in a more southerly direction along the River Dove. I wondered about the fishing here, as the Dove is well-known for trout, and indeed we soon passed a fly-fishing party heading for a beat. 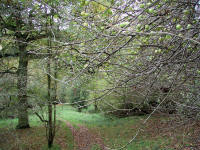 The path was not always clear around here, so we had to navigate carefully to avoid encounters with barbed wire. 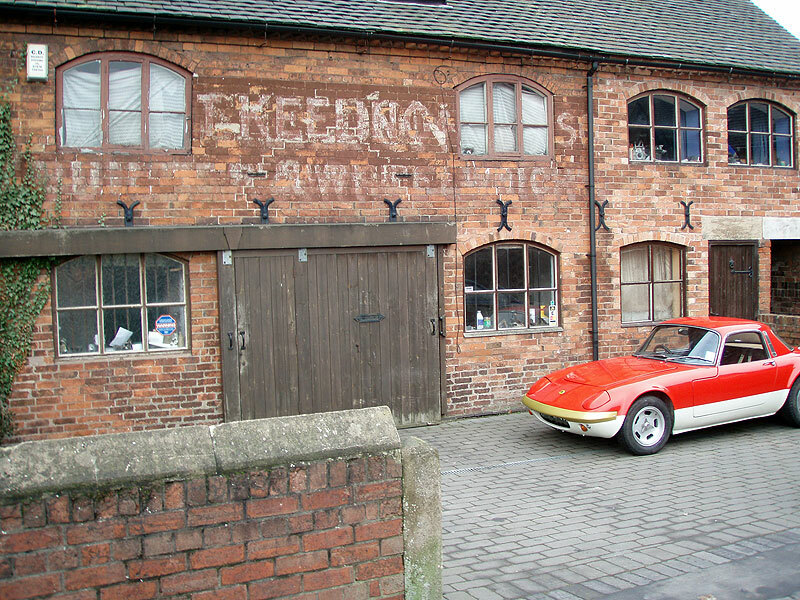 Soon we were at Sedsall, which turned out to be a spectacular ruin: then as we approached the very noisy Eaton Hall Farm it began raining and we pulled on our waterproofs. I hadn't realised, but I'd been here a few years ago. 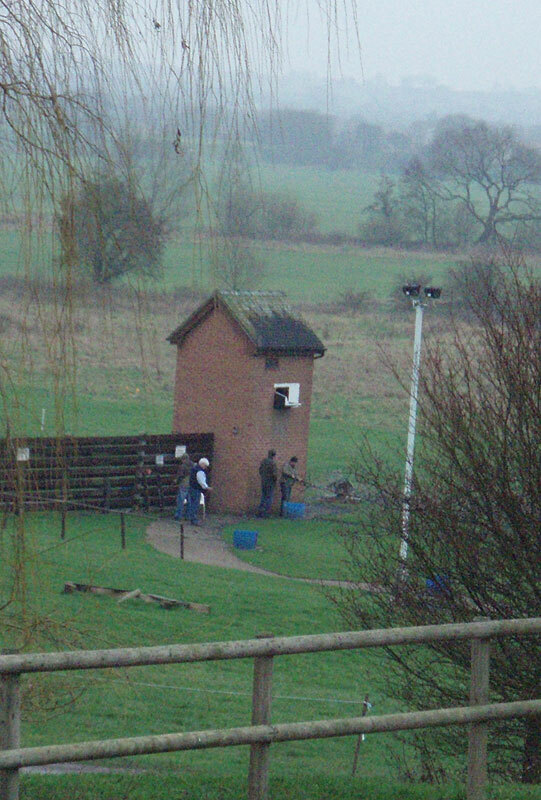 This is the Doveridge Clay Sports club, which I visited as part of my brother's Stag weekend. 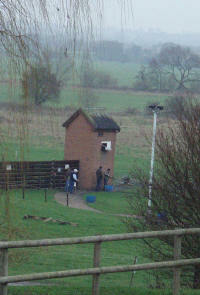 No wonder it was noisy, as this is a large and popular shooting venue. Another short pull to the top of the river terrace led to a dreary couple of miles of flat walking to Uttoxeter Racecourse and the railway station, where we arrived (on time) at 3 o'clock. 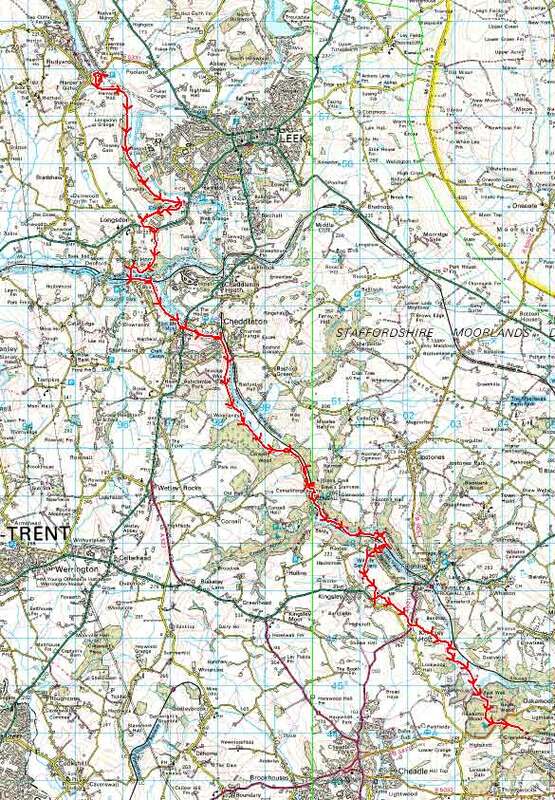 With only one more substantial section of the Staffordshire Way to complete, I was keen to continue before the end of winter, so soon started planning for a January or February return. This weekend trip had to be planned with military precision: only one day off work, the Isle of Man to Liverpool ferry out of action after a collision, and no Chrissy due to other commitments (so no lift to the starting point). The best option was to drive down on Friday morning to the B&B in Great Haywood (near Stafford), catch a bus to Uttoxeter and walk back, then on Saturday walk to Lichfield and catch a bus back to Great Haywood. Sunday was going to have to be wasted on the return journey, as the boat for the island leaves at 2.15 p.m. and it's at least a 2 hour drive up to Heysham. Thanks to the wonders of the Internet, I was able to work out the full plan in advance. Knowing the bus times was a great help: the Arriva timetables are available on the internet so I knew that I could catch a bus at 10.04 from Great Haywood. Despite the best efforts of the weather, I was at the bus stop and the bus arrived on time. The roads were passable as well, which had been a worry due to the heavy snow in the area the previous day. 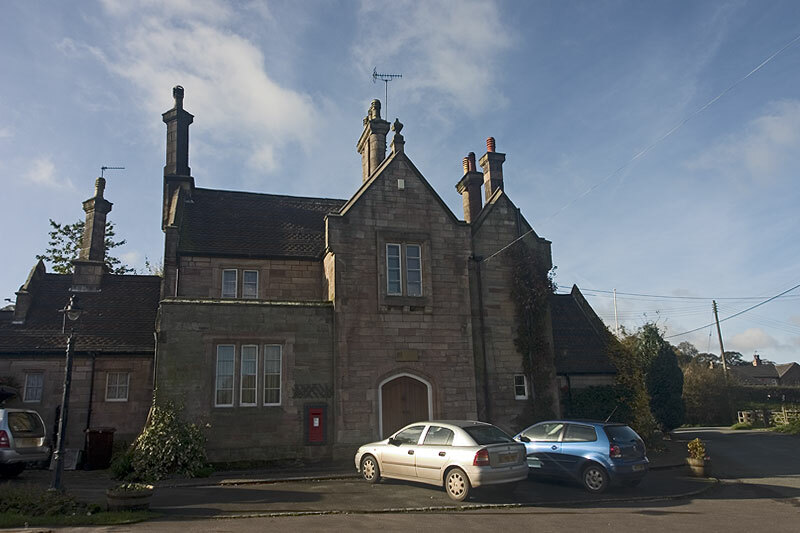 I'd parked the car at the B&B (High Meadows): I hadn't been able to summon the owners, so I called them from Uttoxeter to let them know that it was my car on their driveway, and to assure them that I'd be arriving before 5. So, setting off on time from Uttoxeter bus station seemed like an achievement in itself. Icy pavements and uneven snow warned of difficult conditions ahead, but I expected that countryside footpaths would be easier, and a trekking pole was enough to be confident of safe progress. Uttoxeter didn't seem very attractive, although I was seeing it in the worst conditions as the weather was very grey and chilly. I was pleased to leave the built-up area by a confusing line through a new estate, eventually finding a good path leading out of town. Once in the open fields, I learnt how tricky route-finding became once the footpath was buried under snow. The line across a field was guesswork unless you could see a stile or gate over the other side: often fields are too big to allow this. The GPS kept me on line, however, and I was relieved to find that my pre-prepared route was generally very accurate on the ground. The main hindrance to a steady pace was the large number of field boundaries: each one had only a small stile, and the stile would be covered in snow. So extra care was necessary to avoid a slip, slowing progress quite a bit. Around Scounslow Green it became quite awkward to move at any pace, with a series of fields and direction changes requiring some concentration. It was with some relief that I came across a short section of tarmac walking to Marlpit House Farm, which was steadier and allowed me to enjoy the scenery rather than just planning the next few steps. Marlpit House Farm looked quite a wonderland in the snow. Fresh snow hides all the blemishes: muddy ruts and abandoned tyres become interesting dimples and bumps in the pristine white. 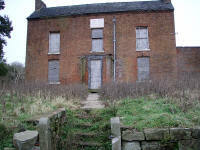 Not that there are any around this farm, which looks a superbly well-appointed set of buildings. Beyond the farm, the lane stayed easy for a while, until a turnoff to another farm (Parkstile) had to be left in favour of a very muddy section. But soon, more open ground beckoned. At first, this was an impressive snow desert: the only sign of a path being a single line of footprints up the gentle hillside. 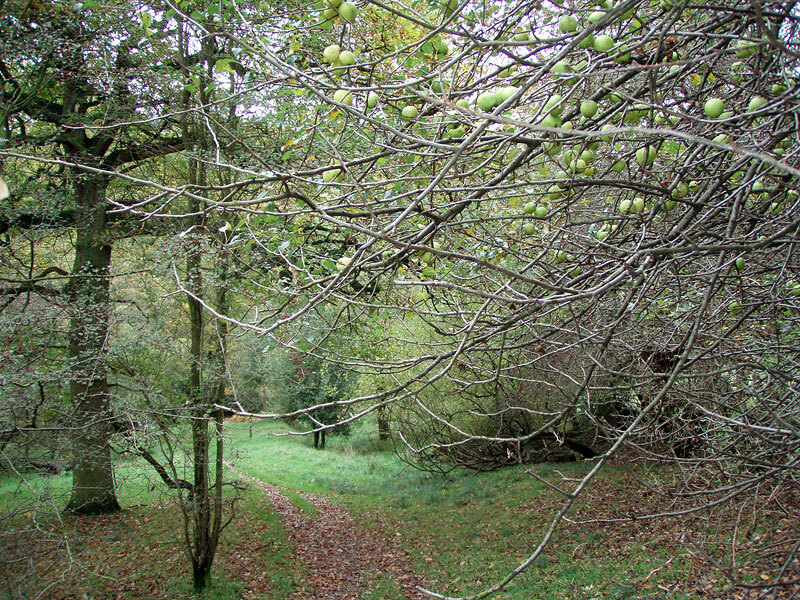 Then the path continued alongside a very attractive little wood, turning left at the bottom of a shallow valley to follow the hedgerow through the beautiful Bagot's Park for a while. This was possibly the best section of the walk since Dimmingsdale, but here I discovered the disadvantage of gaiters in these conditions. The snow began to ball-up under my feet, so that I had to stop to knock it off every ten steps. Otherwise, I was walking with each foot attached to a six-inch diameter snowball - uncomfortable and dangerous. I wondered what was causing it, later realising that the strap holding the gaiter in place under my foot was making the snow stick. I didn't see the famous herd of goats in Bagot's Park, and soon I left it at the road just north of Abbots Bromley. 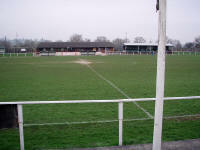 The weather had turned nasty, with snow starting to get fairly heavy, blowing at me in a cold wind. At the road junction were a couple of council workers in a van: they expressed surprise that anyone would volunteer to be out walking in these conditions. I guess that I probably wouldn't have been, but for this E2 project and the lack of opportunity to pursue the walk without planning ahead and booking days before the weather can be forecast. I stood for a while in the shelter out of the wet snowfall and had lunch (a pork pie and banana - quite a large lunch for a walking day). Chilly after standing around for some time, I hastened on. At first the way was confusing: the Staffordshire Way appears to run through the churchyard and although it was nice to inspect the church I failed to see any signs directing me along the route. 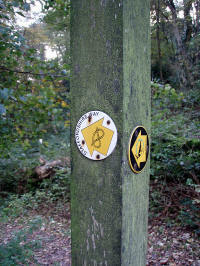 Signposting had been quite good up to this point, but there was nothing here to help. 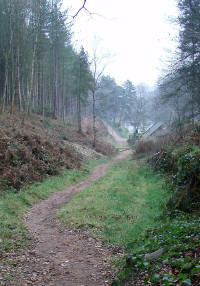 So I found the lane which leads south out of the village, and used that to reconnect with the E2. Before a road junction, the map shows the path leaving the lane to cross a field. Again, this was not obvious on the ground so I elected to stay with the lane. After the road junction the path crosses fields on the approach to Blithfield Reservoir. In these conditions the way looked unappealing, and as the road took a close and parallel path I used this more pleasant route, rejoining just before the Water Authority buildings. I was hoping to get a good view of the reservoir, a fairly modern one opened by the Queen Mother in 1953, but only saw the dam wall. Crossing the River Blithe, an unnecessary and illogical diversion is specified, taking the footpath round a large grassy field for no apparent reason. So I cheated again and kept to the good going on the road, cutting out a few hundred yards. I suspect that there are right of way issues here as I can't imagine that anyone thought that the Way would benefit from the tedious plod around an uninteresting field. 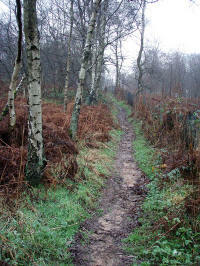 The approach to Stockwell Heath began up a tiring, slippery hillside but became more enjoyable above. 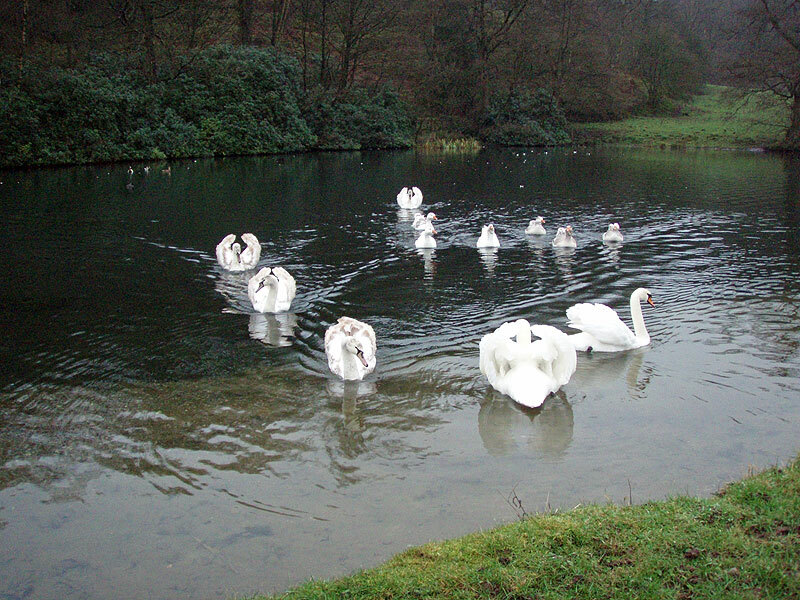 The hamlet itself is a picturesque little English village centred on a duckpond. With ducks aplenty even on a bleak day like this. I turned off the road too early when leaving Stockwell Heath, and spent some time in a field with horses, trying to work out where the path went. In fact, the turnoff was a little further along the road. I found it eventually and was soon marching through the fields alongside the larger village of Colton. Exiting through the village hall grounds onto the main road, I turned right past an impressive old house and a school (although it was only 3 o'clock, there were mums arriving to pick up their kids). The village is quite historic, but the Way mostly avoids it in favour of the fields at the side, leaving only the south-western tip for the wayfarer to enjoy. 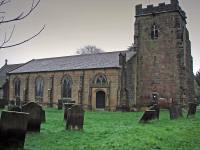 ...and views of the church. 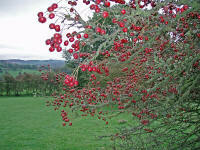 The snow had eased off, and the walking was rather less of a drudge as a consequence. I really prefer walking in shorts and light shirt rather than having to be protected from the elements so much, but at least when it's dry you don't feel too encumbered and you can take in the scenery without feeling that you'd rather be indoors! Soon I was at the Trent and Mersey Canal, the last section before Great Haywood and a hot bath. Changing direction to north-west, I joined the tow path at some major engineering works and set off expecting a good steady slog. Underfoot was not as easy as expected, however, and the snow started up again. This time, dense clouds of heavy, wet snowflakes obliterated any distant views and with failing light the prospect ahead became quite unwelcoming. 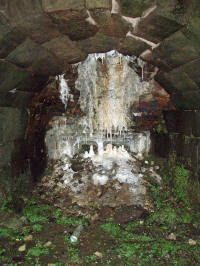 I ground out the miles, pausing only to snigger at some unusual snow "sculptures" fashioned by canal boat people. 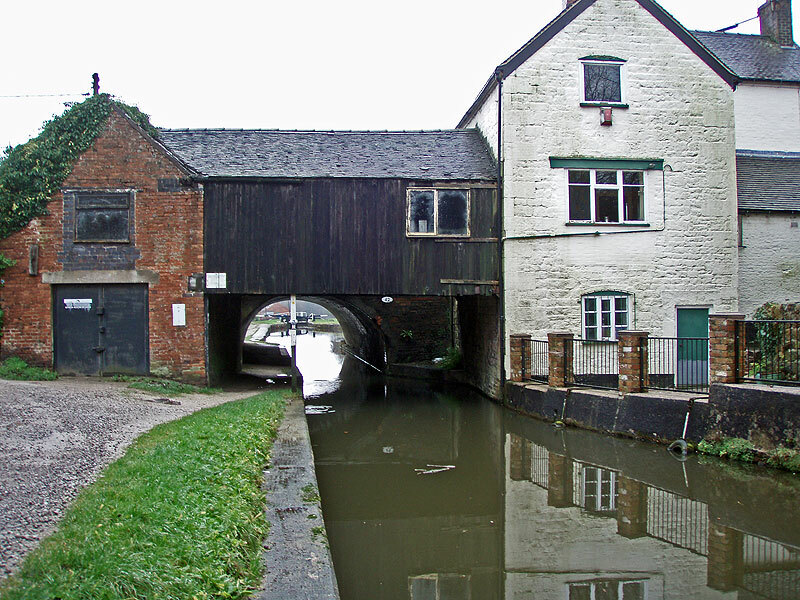 I didn't have much inclination to study the map very carefully, and walked past the bridge at Great Haywood. 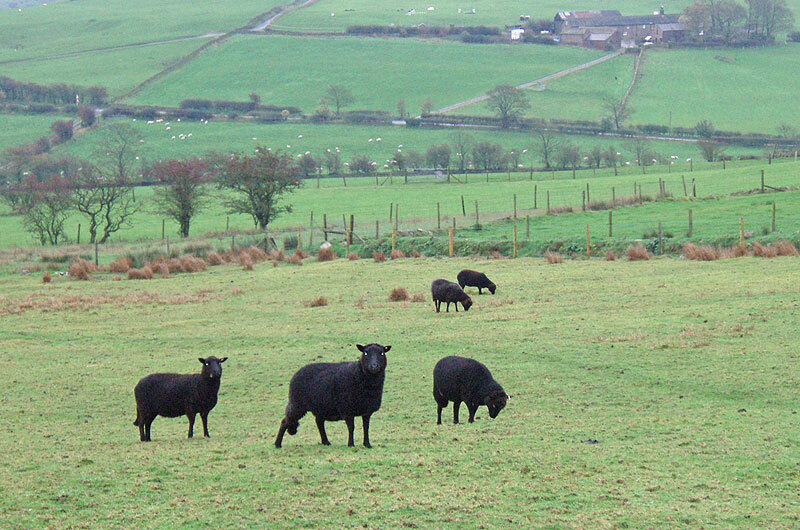 I soon realised though, and was quickly up the main street and back to High Meadows by half past four. After a good welcome, I left my soaking wet outerwear in the drying room and enjoyed my well-deserved bath. The evening meal was a rather indifferent Chinese at the local pub.